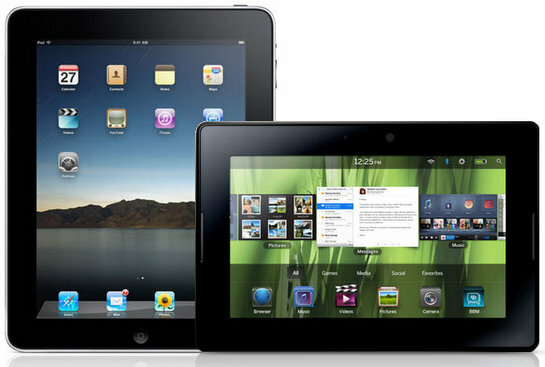 Tablet Wars: Does the Blackberry Playbook Top the iPad? The iPad certainly has a big name, but some tech experts thing the Blackberry Playbook actually tops it in several respects. Of course, it doesn’t have access to all the cool Apple apps, but if you’re more of an internet surfer than an app user – or if you’re looking for a great accessory mainly for business use – the Playbook from RIM might actually be a better options. Of course, it all ultimately comes down to preference in many areas. But who doesn’t want better internet speeds, which the Blackberry version promises to offer? Here’s the breakdown of different ways the Playbook may beat the iPad after all. The number-one thing that sets the iPad apart from everything else is the thousands of apps that are available for it. The thing that sets the Blackberry Playbook apart, though, may be even better for some users. It’s got higher internet connection speeds, which mean less time waiting on downloads and an easier time surfing the web. The CEO of RIM actually argues that higher internet speeds will draw more users than Apple’s gazillion apps any day, since you can use the web to do just about anything your apps can do. The Apple iPad isn’t the best for multitasking. Sure, you can nominally do a few things at once, but, really, you can’t multitask like you can on a laptop. The Blackberry is said to have “true” multitasking, which means it can actually fully run more than one program at once. For business users and even everyday people who are addicted to doing multiple tasks at the same time, this could be a pretty big draw. The Playbook comes with 1GB of RAM, whereas even the iPad2 doesn’t have nearly that much. It’s the RAM that means the multitasking can be easier, and it also means you can work more effectively and efficiently on the Playbook. The Blackberry is smaller and lighter than the iPad, which is a big draw for travelers and many business consumers. This, though, is really something preference-based. While the Playbook’s screen is more pixel-dense for a better picture, the picture will inevitably be smaller. If a larger viewing screen is a necessity for you, you’re more likely to enjoy using the iPad, even though it’s a bit heavier. It’s hard to make a statement about durability before both items have been out for a while, but many experts guess the Blackberry product will be more durable. For one thing, there’s less screen to get damaged, which can be a good thing since screen damage is one of the hardest things to fix when it comes to tablets. Also, the Playbook comes with a harder rubber shell that can protect it from falls and such, so you need fewer protective extras that bulk it up and add weight. While both tablets feature front and rear cameras, those on the Blackberry Playbook are undoubtedly better. The back camera shoot video at a high rate, and the front camera allows for video conferencing. The back camera has five megapixels of power while the front has three megapixels and can support 1080p, whereas the iPad’s camera resolution is much lower than this. You can also use a standard micro USB to load your pics from your tablet to your regular computer if you want. If your business already has Blackberries for business purposes, the Playbook is undoubtedly the best choice. It’s more secure than the iPad and won’t even store sensitive business information on itself. Instead, it accesses your business’s network through the Blackberry phone the user carries. Non business users who already love Blackberry products will find that this is helpful, as well. You can use the tablets to check out anything that’s on your phone, which is convenient when you’ve already got one. If you don’t already have a Blackberry, this might be a drawback rather than a bonus, particularly if you’re looking into these tablets for business use. There are only a few ways that the Blackberry Playbook solidly beats the Apple iPad, but these are pretty significant. Better browsing speed and much better camera quality both come to mind here! It comes down to what you’re looking for in a tablet, which products you already use, and what costs look like for you. It will also depend, of course, on what your current cell phone and data plan carrier is going to charge you for using your tablet online on the go. Checking out both options is worth your while, and you shouldn’t just go with the iPad because you assume the Apple name means it’s better. Stephanie Phillips is a social media advocate and blogger at the credit card comparison website, www.creditdonkey.com. She’s also a fan of all things mobile.